A photo of Notre Dame before fire is going viral for all the right reasons. Why a photo taken outside Notre Dame hours before the fire is going viral. 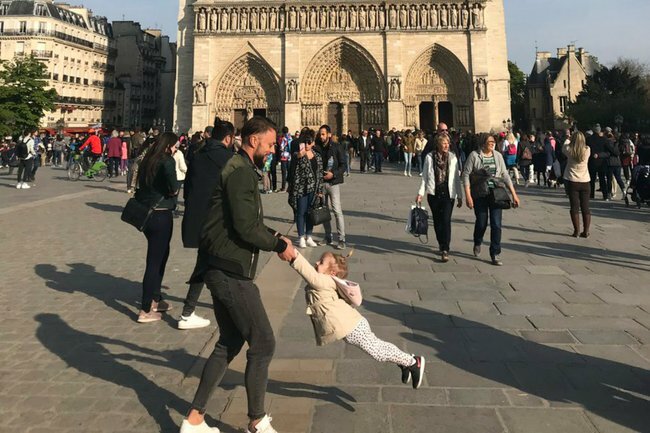 A photo of what appears to be a father dancing with his daughter outside Notre Dame just an hour before it was engulfed in flames. Brooke Windsor, the woman who took the photo, posted it Twitter as the disaster unfolded. “I took this photo as we were leaving #NotreDame about an hour before it caught on fire,” she wrote. “I almost went up to the dad and asked if he wanted it. Now I wish I had,” she added. She finalised the tweet by asking Twitter to help the photo go viral, so that the father and daughter can keep the special image. “Twitter if you have any magic, help him find this,” she wrote. The tweet has since gone viral, with over 48,000 likes and 26,000 retweets, with many trying their best to spread the photo far and wide. It wouldn’t be the first time Twitter has successfully found strangers in an image. Last year, a man took a photo of a couple who became engaged in Yosemite national park in the United States. When he was unable to find them on the day, he took to Twitter for some help. His original post received more than 375,000 likes and 173,000 retweets. It took just 10 days for the internet to pull through for him. “UPDATE: I FOUND THEM,” he wrote. He introduced the couple as Charlie Bear and his fiancé Melissa. Charlie and Melissa were of course then flooded with love and congratulations from everyone who had become invested in Dippel’s search. There is hope that this father and daughter are reunited with the iconic photo outside Notre Dame before the fire.